Post-traumatic Stress Disorder is a mental health condition that is triggered by a terrifying event by experiencing or witnessing it. Most of the sensitive patients who go through traumatic events may have temporary difficulty in adjusting and coping, but with time, people usually get better. Sometimes, persons need some medication to maintain healthy and peaceful life. If the symptoms get worse, last for months or even years, and interfere with day-to-day functioning, then the person may have Post-traumatic Stress Disorder (PTSD). It is natural feeling to be afraid during a traumatic situation. The fight or flight response in our body is a typical reaction which is meant to protect us from harm. Mostly, the persons recover from the initial symptoms but those who continue to experience are diagnosed with this disorder. The symptoms of this disorder generally starts within one month of any traumatic event happened but in some cases symptoms may not appear until a year after the event. These symptoms may cause various problems in person's social life, relationships, working place and in day-to-day activities. This disorder can also interfere with the ability to go about the normal daily tasks. Avoiding people, going to public places etc. Symptoms can vary over time and vary from person to person. Flashbacks: Relieving the traumatic events as if they were happening again. Distressing memories of the traumatic event that recur again and again. Severe physical reactions or emotional stress to something that reminds the person of the traumatic event. Trying to avoid thinking or talking about the traumatic event. Avoiding places, activities or people that remind the person about the traumatic event. Children can re-enact the traumatic event through play. They may face frightening dreams that may or may not include the aspects of the traumatic event. 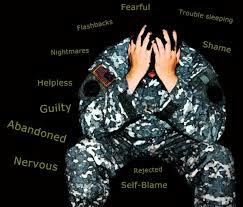 WHAT ARE THE CAUSES OF POST-TRAUMATIC STRESS DISORDER? As the name suggests, it is mainly caused by any mis-happening like serious injury, sexual assault, death of a closed one, problems in relationships, lacking a good support of family and friends, having a job that increases the risk of being exposed to the traumatic events and many other conditions. Stressful experiences including the severity of trauma a person has gone through in his life. Inherited risk of family history of depression or anxiety. Temperament of a person which is an inherited feature of the personality. The way in which brain regulates and releases the chemicals and hormones in the body in response to the stress. After a traumatic event, many people with Post-traumatic stress disorder, at first, such as being unable to stop thinking about what has happened. Fear, anger, depression, guilt, anxiety – all are common reactions to the trauma. But, majority of the people exposed to trauma do not develop long-term post-traumatic stress disorder. A person may have PTSD if the symptoms as described above continued for more than one month and cause significant problems in the ability to function in social and work settings and also negatively impact relationships. The primary treatment is psychotherapy and medication. Ayurveda is such a science that does not include only physical well-being but mental and spiritual aspects of life are also considered. Ayurveda offers various herbal remedies for the patients suffering from PTSD that are safe to use and also help in coping the symptoms by calming down the brain. Brahmi has been used since ancient times for providing strength to the brain as it is believed that it has highly beneficial effects on the brain. It has calming effects on the brain. It helps in relaxing the brain. Brahmi Capsules of Planet Ayurveda are 100% pure, safe, natural and can be used for long time as well as these capsules do not cause any side effects. Ashwagandha, is one of the most valuable herbs in the Ayurvedic medical system dating back more than 3,000 years. This herb is quite useful in stress, insomnia, fatigue, brain disorders, anxiety, palpitation, nervousness, nervous breakdown etc. It gives strength to the brain, heart and muscles. Regular use of Ashwagandha capsules calms the mind, relieves the system and cures insomnia as well. Dose: 1-2 capsules twice daily. 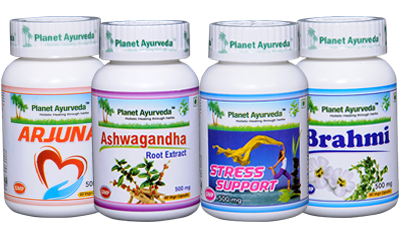 Stress Support Capsules of Planet Ayurveda are packed with wonderful ingredients that help in relaxing the mind naturally and induce good sleep as well. Therefore, Stress Support Capsules of Planet Ayurveda are very useful for the patients of Post-traumatic Stress Disorder. Arjuna is a very famous herb used for cardiovascular problems as it strengthens the heart muscles. It possesses anti-oxidant properties as well. It contains various tannins, polyphenols that protect the heart and keep a check on blood pressure as well. Arjuna capsules provide a great relief to the patients suffering from post-traumatic stress disorder.